Microsomal prostaglandin E synthase-1 (mPGES-1) is an inducible enzyme that catalyzes the conversion of prostaglandin (PG)H2 to PGE2. Proinflammatory stimuli markedly increase levels of mPGES-1 expression both in vivo and in vitro. mPGES-1 knockout studies and animal models of inflammatory arthritis also provide a strong basis for the contribution of mPGES-1 in the increased local production of PGE2 observed in inflammatory arthritis. The focus of this article is to review some recent advances in our understanding of mechanisms specific to the regulation of inducible mPGES-1 in inflammatory arthritis. Prostaglandin (PG)E2 is the pivotal eicosanoid involved in the development and perpetuation of inflammation seen in diseases such as rheumatoid arthritis. In this disease, local inflammation of synovial tissue is characterized in part by increased local levels of PG, predominantly PGE2 . In the eicosanoid pathway, induction of PGE2 biosynthesis during inflammation requires the enzymatic actions of two cytokine-inducible enzymes: cyclooxygenase (COX) and prostaglandin E synthase (PGES) (Fig. 1). An important role for COX-2 in producing PG in patients with inflammatory arthritis has been clearly shown in clinical trials that demonstrate equal efficacy of specific COX-2 inhibitors and nonspecific nonsteroidal anti-inflammatory drugs (NSAIDs) . Whether a similar essential role exists for the inducible microsomal prostaglandin E synthase-1 (mPGES-1) in the localized increase of PGE2 during inflammatory arthritis in humans is currently unclear. 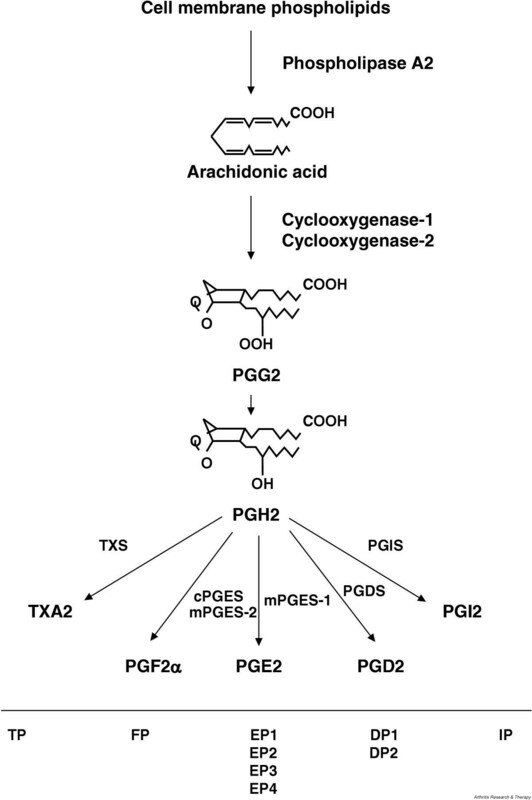 The prostaglandin E2 (PGE2) biosynthetic pathway. DP, PGD2 receptor; EP, PGE2 receptor; FP, PGF2α receptor; mPGES, microsomal prostaglandin E synthase; PG, prostaglandin; TP, thromboxane A2 receptor; TXA2, thromboxane A2. Microsomal prostaglandin E2 synthase-1 belongs to the MAPEG (membrane-associated proteins involved in eicosanoid and glutathione metabolism) superfamily (Table 1). It was initially identified as a homologue to another member (MGST1; see Table 1) and was found to have significant glutathione-dependent PGE2 synthase activity . The human mPGES-1 gene maps to chromosome 9q34.3, contains three exons and two introns, and spans approximately 14.8 kb ; the purified recombinant enzyme weighs approximately 17.5 kDa. It has a Vmax of 170 μmol min-1 mg-1 and a kcat/Km of 310 mM-1 s-1 for the conversion of PGH2 to PGE2 at 37°C, which is orders of magnitude higher than other terminal PG synthases and establishes a key role for mPGES-1 in PGE2 synthesis in vivo . There is 80% sequence homology between mouse/rat and human mPGES-1. Mutation of Arg110, but not Tyr117, results in abrogation of the catalytic function of mPGES-1 ; these two amino acids are highly conserved in the MAPEG superfamily. In addition to mPGES-1, two other isoforms of PGE synthase have been cloned and characterized. Cytosolic PGES (cPGES) is constitutively expressed in a wide variety of mammalian cell lines and tissues and is not responsive to stimulation with bacterial lipopolysaccharide (LPS) . Another isoform, termed microsomal PGES-2 (mPGES-2), is ubiquitously expressed under basal conditions in many tissues and is activated by reducing agents . The relative roles of these constitutive enzymes for basal PGE2 production are currently unclear. Furthermore, it has not yet been determined if these enzymes can contribute to increased PGE2 production during inflammation. Of the two enzymes, it appears that mPGES-2 can function more effectively in conjunction with COX-2, while both cPGES and mPGES-2 are capable of functioning efficiently with COX-1 to produce PGE2. In wild-type rats and mice, constitutive mPGES-1 expression in tissues such as stomach and kidney appear to contribute to small amounts of basal PGE2 production [9, 10]. However, upon injection with LPS, these animals show up-regulation of mPGES-1 in most tissues and markedly increased PGE2 production [9–11]. In rat paws of acute (carrageenan-induced) and chronic (adjuvant-induced) arthritis models, significant up-regulation of mPGES-1 RNA and protein expression was observed, compared with other PGE synthases, and was also associated with elevated PGE2 levels [9, 12, 13]. Consistent with these findings, increased mPGES-1 expression is seen in synovial tissue of patients with rheumatoid arthritis [14, 15]. Insight into the role of mPGES-1 in inflammatory disease has been facilitated by the development of mPGES-1 null mice by two different groups: one on a C57BL/6 × 129/SvJ background, the other on a DBA1/lacJ background [16, 17]. Both strains of mice exhibit normal longevity and fertility and are phenotypically indistinguishable from their wild-type litter-mates. In mPGES-1 knockout mice injected with LPS, PGE2 synthase activity was only minimally increased in tissues. In peritoneal macrophages derived from LPS-stimulated mPGES-1 knockout mice, minimal elevation in PGE2 production, but no difference in tumor necrosis factor α (TNF-α), IL-6, or IL-12 levels was observed [10, 11, 16, 17]. Together, these findings establish mPGES-1 as a critical source of inducible PGE2 synthetic activity in vivo. The importance of mPGES-1 in inflammatory arthritis was further demonstrated by a study of collagen-induced arthritis in mPGES-1 null mice. These mice exhibited reduced incidence and severity of disease compared with wild-type controls, both clinically and histopathologically. This difference was not associated with alterations in IL-6 production by peritoneal macrophages or significant differences in circulating IgG2a anticollagen antibodies . In collagen-antibody-induced arthritis, mPGES-1 null mice had a similar incidence but a lesser severity of arthritis than wild-type mice, as well as a 50% reduction in paw levels of PGE2 . In other models of inflammation, mPGES-1 null mice show impaired delayed-type hypersensitivity responses , as well as some evidence for impaired formation of inflammatory granulation tissue and angiogenesis . The role of mPGES-1 in the central nervous system regulation of fever and nociception in inflammatory states is also well described. Animal pyresis models show transient up-regulation of mPGES-1 mRNA in brain endothelial cells after systemic injection with endotoxin or IL-1 [18, 19]. Additionally, peripheral inflammation from carageenan-injected paws was associated with increased mPGES-1 expression and PGE2 levels in the central nervous system . In a more chronic inflammation model, rats with adjuvant-induced arthritis displayed sustained induction of mPGES-1 by immunohistochemistry in the brain vasculature and the paraventricular nucleus of the hypothalamus . mPGES-1 null mice did not generate fevers in response to peripheral LPS injection but did become febrile after intracerebroventricular PGE2 injection . Together, these findings highlight PGE2 derived from mPGES-1 in the central nervous system as a critical mediator in inflammation-induced pyresis. Studies also describe mPGES-1 in pain models. mPGES-1 null mice exhibit diminished writhing in response to intraperitoneal injections of acetic acid (especially after LPS priming ), similar to NSAID-treated wild-type mice . There was no difference between null and wild-type mice in withdrawal latency upon thermal stimuli, a model of non-inflammatory pain [16, 22]. However, in a model of neuropathic pain involving hyperalgesia following transection of an L5 (fifth lumbar) spinal nerve, mPGES-1 null mice had higher withdrawal thresholds and latency upon both mechanical and thermal stimuli compared with wild-type mice . Similar to COX-2, mPGES-1 is highly up-regulated by proinflammatory stimuli and participates in the generation of elevated PGE2 in inflammation. In response to IL-1β and/or TNF-α, up-regulation of mPGES-1 expression is observed in rheumatoid arthritis synovial fibroblasts, as well as in many other cell types [6, 23–26]. Moreover, an antisense oligonucleotide blocking mPGES-1 expression inhibits PGE2 production, osteoclastogenesis, and bone resorption in mouse osteoblast coculture stimulated with IL-1β and TNF-α . The inhibitory actions of glucocorticoids also establish an important role for mPGES-1 in inflammation. In studies examining rheumatoid arthritis synovial cells and osteoarthritis chondrocytes, treatment with dexamethasone decreased mPGES-1 mRNA and protein expression mediated by proinflammatory cytokines [23, 25, 27]. To date, few studies have addressed signal transduction mechanisms responsible for up-regulation of mPGES-1 in arthritis. Masuko-Hongo and colleagues have recently demonstrated a role for extracellular-signal-regulated kinase-activated and p38β mitogen-activated protein kinase signaling pathways in the regulation of mPGES-1 expression in osteoarthritic chondrocytes stimulated with IL-1β . However, further investigations are necessary to more extensively define signaling mechanisms that influence the modulation of induced mPGES-1 expression. The promoter region of the mPGES-1 gene does not contain transcriptional elements that are present in the COX-2 promoter and promoters of other cytokine-inducible genes  (Fig. 2). Examination of a 651-bp promoter region revealed the presence of GC boxes, Barbie boxes, and an aryl hydrocarbon regulatory element (ARE), consistent with other members of the MAPEG and glutathione-S-transferase families. The mPGES-1 promoter lacks a TATA box and other transcriptional elements typically identified in cytokine-responsive genes. Using a promoter-reporter construct of -651 to -20 bp, modest yet significant transcriptional stimulation by IL-1β was observed in A549 cells . The differences in promoter structure and timing of induction suggest that divergent transcriptional mechanisms are responsible for the inducible regulation of COX-2 and mPGES-1. It was recently shown that the zinc-finger-containing transcription factor, early growth response gene-1 (Egr-1) binds specifically to GC-rich elements in the mPGES-1 promoter region and facilitates murine mPGES-1 gene transcription . More recently, PPARγ ligands have been shown to suppress Egr-1-mediated induction of the activities of the mPGES-1 promoter, and a synthetic promoter-reporter construct in IL-1β-stimulated osteoarthritic synovial fibroblasts . Further analyses will be required to better define gene regulatory mechanisms that modulate the increased expression of mPGES-1, as seen in inflammation. Regulatory elements of the human microsomal prostaglandin E synthase-1 (mPGES-1) and cyclooxygenase-2 promoters. AP-1 or -2, activator protein-1 or -2; c/EBP, CCAAT/enhancer-binding protein; GR, glucocorticoid receptor; NFκB, nuclear factor κB; PR, progesterone receptor; Sp1, specificity protein-1. Our understanding of PG biosynthetic pathways has increased enormously over the past 20 years with the cloning and characterization of a number of enzymes responsible for generation of specific PG. This pathway has been a target for therapeutic intervention in inflammation, pain, and fever for centuries. However, drugs that interfere with the COX enzymes, including COX-2-specific drugs, are associated with significant adverse effects in the gastrointestinal, renal, and cardiovascular systems. Continuing study of other potential targets, including mPGES-1, may yield new approaches to the treatment of symptoms mediated by increased local production of prostaglandins. LJC has acted as a consultant for and received research grants from Pfizer Global Research & Development.